Several readers have brought to my attention a Rules incident concerning South African, Branden Grace, at the recent 2015 WGC HSBC Champions in China. Apparently, the TV commentators were confused as to why he was permitted to take a free drop when his natural stance for a stroke meant that he had to place one foot inside a bunker to play his ball lying just outside of the bunker. The explanation is that one foot of his stance would have been on, or touching, an exposed bunker liner (which is an immovable obstruction). As his ball was lying outside of the bunker, he was correctly permitted to take relief without penalty from the interference, under Rule 24-2. So he dropped his ball outside of the bunker within one club-length of the nearest point of relief that avoided the interference from the bunker liner, not nearer the hole and not in the bunker. Of course, if his ball had been in the bunker, he would still have been entitled to take relief, but would have had to drop his ball in the bunker. 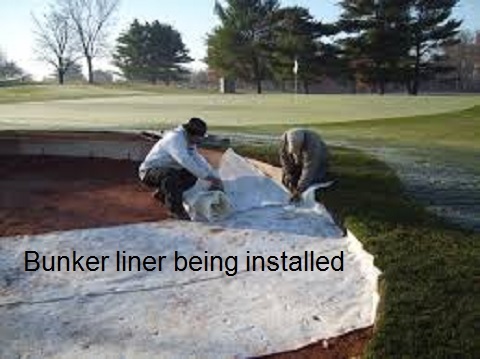 There may be readers that have not come across artificial bunker liners, so I have included the photo of one being installed. Of course, the question that one might ask, is why a course hosting an important international golf tournament has a bunker with an exposed liner? Four LPGA stars missed their tee time last Saturday at the Lorena Ochoa Invitational in Mexico City. Carlota Ciganda, Suzann Pettersen, Angela Stanford and Minjee Lee all left their Mexico City hotel on their short journey to Club de Golf Mexico, for the third round of the 36-player event, in a shuttle bus provided by the tournament organisers. However, due to heavy Mexico City traffic and road works, the shuttle driver, chose to take a detour. Unfortunately, that decision turned what should have been a 20-minute ride into a two-hour ordeal, resulting in the four players missing their tee times and other groups due to start behind them being delayed. The player must start at the time established by the Committee. If the player arrives at her starting point, ready to play, within five minutes after her starting time, the penalty for failure to start on time is loss of the first hole in match play or two strokes at the first hole in stroke play. Otherwise, the penalty for breach of this Rule is disqualification. Where the Committee determines that exceptional circumstances have prevented a player from starting on time, there is no penalty. Interestingly, Decision 6-3a/1.5 suggests that heavy traffic resulting in the journey to the course taking longer than expected is not a sufficiently exceptional circumstance to avoid disqualification. In this case the fact that the transport was being organised by tournament organisers meant that it was outside the control of the players and they were permitted to tee-off late. Of the four players only Ciganda seemed to put the episode behind her once out on the course, shooting 69, compared to Stanford’s 76, Pettersen’s 75 and Lee’s 73.
are there bunker liners on the Old Course? Really, what is the purpose? I understand that bunker liners are increasingly used on golf courses to improve drainage, control erosion, reduce maintenance cost, improve course aesthetics and add green fee revenue. Not all courses have the greenkeeping staff or revenue available at the Old Course.